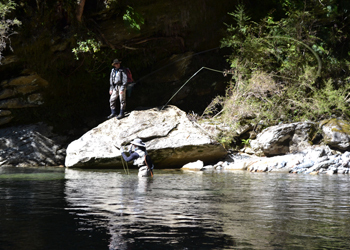 Nelson, New Zealand's fly fishing locations are world renowned. Stalking and site casting to big wild brown trout in crystal clear water is a fly fisherman's dream come true. Your trophy trout could only be a cast away! 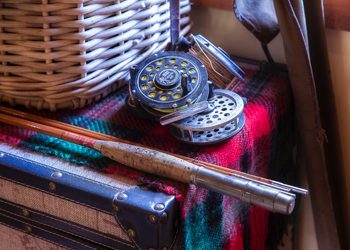 The Lodge stocks a wide variety of top quality SIMMS waders and boots, and SAGE fly rod and reels, which are available to guests complimentary. This region repeatedly records the most sunshine hours of all of New Zealand, combined with the crystal clear waters and dozens of rivers and streams to choose from, the guided fly fishing experience offered from Stonefly Fishing Lodge can be most memorable. Average catch size of brown trout in this region is approx 4lb-5lb, with catches of 8lb plus quite common and the chance of a trophy 10lb brown trout may only be a cast away. The wide choice of rivers available from Stonefly Fishing Lodge enables guests to experience relatively gentle flowing easy access rivers to more adventurous back country streams requiring more accurate casting and a suitable level of fitness. The location also allows a wide choice of rivers from different catchment systems enabling the fly fishing guides to pick the most appropriate fly fishing destination according to the various flow rates at a particular time of year. Stonefly Fishing Lodge is ideally situated on the banks of the Motueka River between the confluence of the Wangapeka River and the confluence of the Baton River allowing our guests immediate access to some of the best fly fishing waters in New Zealand. Further afield, within an hours drive, guests can access dozens of quality fly fishing streams and rivers within the Nelson Lakes and northern Murchison region. With the aid of a helicopter dozens more fly fishing locations become available to guests at Stonefly Fishing Lodge targeting the ever assertive wild brown trout. Stonefly Fishing Lodge can be a base for many different fly fishing experiences and we can offer guided two and three day excursions to some spectacular remote locations in high country waters in the region which involve overnight accommodation in DOC (Department of Conservation) Huts. All sleeping gear, safety gear and meals are catered for. 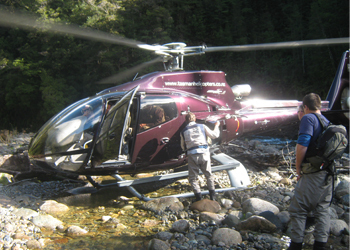 Access to the start of the excursions can be by road, boat or helicopter depending on the location chosen and all packages take you into some of New Zealand's most pristine wilderness fly fishing environments. These trip options access very remote waters with the lure of exceptional fly fishing experiences, however a moderate to high level of fitness is required according to the various flow rates and weather conditions at a particular time of the year. Please contact us for specific itineraries available. "The Motueka River supports one of New Zealand's highest trout populations and recent drift dives indicate populations of 100-500 trout per kilometre." "The Wangapeka River has some of the clearest water in New Zealand"
"The best day fly fishing EVER"
"A Spouse weighs in at Stonefly Lodge"
Orvis Endorsed Fly Fishing Lodges represent the best fishing experiences in the world. As an Orvis Endorsed property, Stonefly Lodge is committed to excellence and the high standards of this exclusive fly fishing program. Orvis sought out the best fishing lodges, outfitters, and guides in the world, all of whom are located in exceptional fishing areas, and who have a reputation for superior client service. The result was the Orvis Endorsed Lodge, Outfitter, Expedition and Guide Program. All participants share the ideals of excellent service, great fishing, and an experienced staff. All operations are continually reviewed by the Orvis staff and must continue to meet their rigorous requirements.